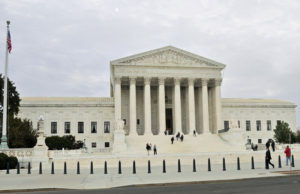 During its first 145 years, the United States Supreme Court was homeless. Its current home pays homage to the many sources of American legal traditions. When the Supreme Court first convened in 1790 it had no established place to meet, so the justices gathered in the Merchant’s Exchange Building in New York City, then the federal Capital. When the Capital moved to Philadelphia, the Court met in Independence Hall and then City Hall. Since the plan for the new Capital in Washington, D.C., made no provision for a home for the Supreme Court, it met in various locations in the Capitol Building. In 1929, former President William Howard Taft, then Chief Justice, convinced Congress to appropriate nearly ten million dollars to build a permanent home for the Court. The building, just east of the Capitol, was completed in 1935. The colonnaded building, designed by architect Cass Gilbert, was inspired by the Parthenon, a temple to the goddess Athena in Athens, the birthplace of democracy. In place of the Parthenon’s mythological scenes, the reliefs of the Supreme Court Building celebrate influential lawgivers. The east pediment, considered the rear of the building, pictures Moses, Confucius and Solon above the motto, “Justice, the Guardian of Liberty.” The theme that American legal and judicial ideals draw on many sources is continued in friezes along the inside walls of the Court chamber. The frieze on the south wall features lawgivers from antiquity, including Menes, Hammurabi, Draco and Augustus. The north frieze includes the more recent Justinian, Charlemagne, John of England, Louis IX of France and Napoleon. The north frieze also includes a rare relief of Muhammad, carrying both a Quran and a sword, honoring his contributions to Islamic law. A visit to the Supreme Court Building provides visual reminders that our legal understandings have many ancestors.